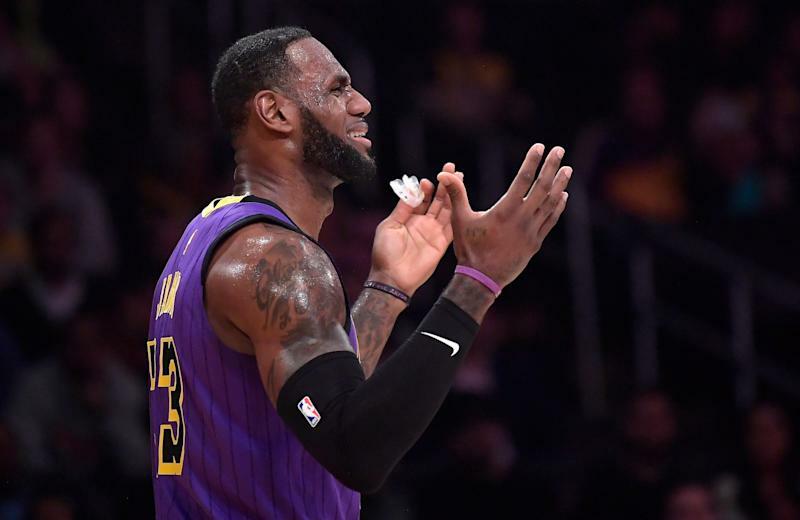 It’s official: the Los Angeles Lakers have been eliminated from postseason contention and the NBA playoffs will be without LeBron James for the first time since 2005. The Lakers lost to the Brooklyn Nets by a score of 111-106 on Friday, their 10th loss in their last 11 games and one that mathematically eliminated the team from the playoffs. The Lakers were effectively eliminated long ago, but this season naturally had to come up with one last ignominy. This time, it was receiving the official elimination loss at home against a Nets team led by a player the Lakers had previously cast off. D’Angelo Russell finished with 21 points, 13 assists and three steals to finish off his former team, another highlight in what has been a breakout season for the point guard. Nearly two years ago, the Lakers traded Russell to the Nets along with Timofey Mozgov’s albatross contract to the Nets for Brook Lopez and Kyle Kuzma. The move was meant to make room at point guard for Lonzo Ball, who was shut down earlier this month with an ankle injury. Russell has since blossomed into an All-Star and the exact kind of reliable offensive option that the Lakers could have used this year. Another ex-Laker, Ed Davis, also finished with 14 points and 15 rebounds for the Nets off the bench. Funnily enough, the Lakers actually showed a lot more fight than usual in their current run of losses, but it obviously wasn’t enough. There was rarely a lead larger than five points for either team, and LeBron James finished with 25 points, 14 assists and nine rebounds in his return from a groin injury. However, he also shot a ghastly 8-of-25 from the field. The Lakers still have 10 games left to play, but with Ball and Brandon Ingram shut down and LeBron James on a minutes limit, their only incentive going forward is to lose and improve their lottery position. To do that, they could also shut down James, but pride might stop that from happening. The Lakers now haven’t reached the playoffs since 2013, the longest drought in team history. It’s also the fourth longest active playoff drought in the NBA, behind only the Sacramento Kings, Phoenix Suns and Orlando Magic. The team will enter this offseason with some hard questions to answer. Will the team be able to land another superstar to play alongside James? Are Ball, Ingram and Kuzma truly stars in the making, or would the Lakers get more use out of them as trade chips? Can they find an improvement from Luke Walton at head coach? We’ll see if the LeBron James show gets any better in Season 2.